A Republican legislator wants to allow Arizona businesses to pay some students 34 percent less than the state’s minimum wage, and his GOP colleagues on a House panel gave the measure preliminary approval Monday. House Bill 2523 gives employers the discretion to pay the federal minimum wage rate, which is $7.25, to full-time students younger than 22 years who work fewer than 20 hours a week or for intermittent periods. Voters in 2016 approved Proposition 206, which set Arizona’s minimum hourly wage at $11 for 2019. Rep. Travis Grantham, R-Gilbert, said the state’s current minimum wage is too burdensome for employers who want to hire part-time workers. There is no evidence that the minimum wage increase that took effect in 2017 has had any negative effect on employment in Arizona. Private sector employment is up by 3.6 percent in the past 12 months, according to data from the state Office of Economic Opportunity. In the restaurant and bar sector, which hires many of the state’s minimum wage workers, employment is up 5.6 percent in the past year. The bill passed Monday on a party line vote in the House Regulatory Affairs Committee, which Grantham chairs. Republicans supported the measure and Democrats opposed it. Rep. Pamela Powers Hannley, D-Tucson, said the bill increases the financial burden on students. John Riches, an attorney for the libertarian Goldwater Institute, said Grantham’s proposal isn’t in conflict with Prop. 206 because it doesn’t change the minimum wage statute. Instead, it creates a category of employee, which the legislature can do, he said. Brenda Muñoz Furnish, an attorney with the William E. Morris Institute for Justice, said Grantham’s bill is contrary to Arizona’s minimum wage laws. Arizona’s Constitution prevents lawmakers from amending, repealing or undermining the intent of voter-approved measures like Prop. 206. Riches, from the Goldwater Institute, argued Prop. 206, tilted Fair Wages & Healthy Families Act, was intended for people working full-time and working families. “It wasn’t intended to apply to full-time students working part time or over the summer,” he said. The Goldwater Institute joined business groups last year in an unsuccessful bid to overturn the minimum wage law. Rep. Raquel Terán, D-Phoenix, said she worked knocking on doors for the Prop. 206 campaign and Riches is wrong. Working students are part of working families because they contribute to their household income, she said. Brenda Alvarez, 18, missed school on Monday because she wanted to testify in opposition to Grantham’s bill. But she stepped out of the hearing room before the bill was heard because had to go to work. Alvarez is a student at Westwood High School in Mesa and has been homeless. She said she feels targeted because she’s young, and it’s unfair she’ll be forced to take a pay cut if her employer is allowed to reduce her wages. Several business groups, including the Arizona Chamber of Commerce and Industry, which opposed Prop. 206, are backing Grantham’s bill. Grantham said concerned students should try to work more than 20 hours a week so they wouldn’t be affected by his proposal. Jaqueline Guerra, 18, challenged Grantham’s logic. Guerra is a student at Phoenix College and works 20 hours a week. She said that’s as much as she can work without compromising her academic and extracurricular commitments. Several speakers who opposed the bill said young people shouldn’t be paid less for the same work. Marilyn Rodriguez, a lobbyist for Living United for Change Arizona — which was part of a coalition of groups who pushed the minimum wage initiative — said it’s questionable to presume the financial needs of people under 22 years old is less than those older than 22. Update: A previous version of this story incorrectly stated the bill would apply to student employees between 18 and 22 years. It applies to those under 22 years of age. This seems like plain and simple greed. Legislators who justify their votes on this, pretending to support small businesses, should be voted out. A college kid paying his own way would make almost $5 an hour less next year, when the inane, cruel bill would go into law. A high school kid working to help her family pay the bills would have her pay cut almost in half. 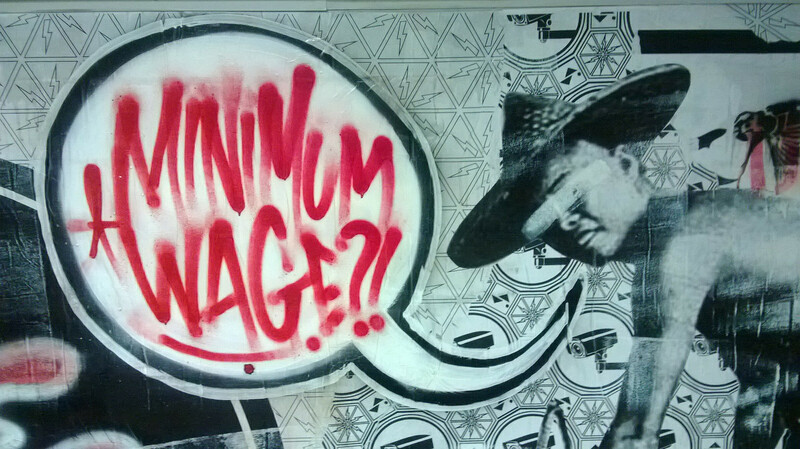 Next year, a minimum wage worker in AZ will make $12/hour. Under Grantham’s Bill, kids under 22 will make $7.25. Grantham, in exchange for giving busineesses greater profit, ensures that the neediest young people among us will be hurt. This is especially problematic at NAU where students are paid much less than $11/hour and do almost every medial job on campus. The entire campus is floated by exploiting its students.